Is a photographer ever satisified with an image? Lexus has a commercial espousing the “Endless pursuit of perfection”. As a photographer, I’m having a greater appreciation of that pursuit. As I look at my favorite images, I see ways I could’ve improved them. I took a picture of the Iwo Jima memorial a few days ago. When I first saw the image on my computer, I thought it was great. However, within a few minutes, I began dissecting the photo and looking at ways to improve it. I noticed that the sky was a little too dark. Although the sky was not completely black, it did not have the “Royal Blue” twilight that I wanted. This is possible using the “Tungsten” WB setting. Previously, I used “Sunny”for most of my shots and I did not change the WB setting until later in the evening. At that time, the sky darkened to the point where I could not get the color I wanted. Also, I manually set the lens to focus on the Capitol. This was necessary because none of the focus points were on the building. In doing that, the statue is not as sharp. Also, the soldier’s foot on the left side of the statue was cut off. I wanted to fix that as well. This pursuit to correct those flaws led me to travel downtown again and take another shot. With the cost of gas, I didn’t want to make another drive downtown in the same week. Yet, I knew I wanted to shoot the downtown Rosslyn skyline as well. Therefore, I decided to take the trip and capture both images. 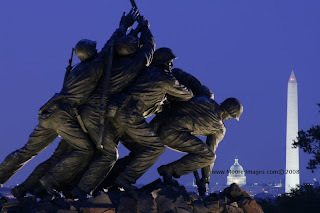 I went to the Iwo Jima memorial to capture the image using the “Tungsten” WB and I would increase my aperture value to put the statue in focus. However, as I improved in one aspect, there were other factors that did not turn out as well. Increasing the aperture did not sharpen the statue as I kept the focus point on the Capitol. I believe using the F/22 value reduced the lens ability to obtain a sharp image–as opposed to the F/10 value I originally used. Also, zooming out to include more of the statue decreased the impact of the Monument and Capitol. Therefore, I ended up cropping the image to look similar to the original shot. Nevertheless, there will always be lessons learned from each image I take. I must learn to maximize my time wherever I am. This requires one to thoroughly exhaust my possibilities whenever I shoot my subject and leave nothing to chance. P.S. Because I got caught-up in trying to improve this shot, I did not capture the downtown skyline. It was too dark by the time I finished. Therefore, I’ll make another trip downtown. I pray these gas prices drop!